For courses in International Relations. International Politics: Enduring Concepts and Contemporary Issues has been helping readers effectively understand politics under governments and beyond for over 40 years. Scholarly articles on essential topics illustrate fundamental debates and differing points of view for a comprehensive and engaging overview of the discipline, while introducing readers to the major forces shaping the world today. The Thirteenth Edition still employs the book’s cornerstone approach of teaching international politics through relevant scholarship that illustrates its theoretical concepts. This edition, however, contains 27% new material spread across each of the book’s four parts. Organizational changes and new information have been added throughout to expand the reader’s introduction to this broad and ever changing field. MyPoliSciLab for the International Relations course extends learning online to engage readers and improve results. Media resources with assignments bring concepts to life, and offer readers opportunities to practice applying what they’ve learned. Please note: this version of MyPoliSciLab does not include an eText. 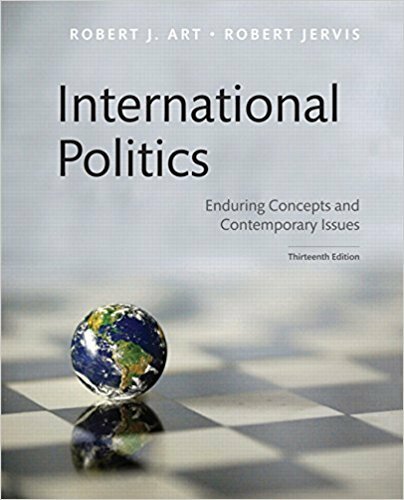 International Politics: Enduring Concepts and Contemporary Issues, Thirteenth Edition is also available via REVEL™ , an interactive learning environment that enables students to read, practice, and study in one continuous experience.